President Trump heads to Arizona Tuesday for a visit to the border and a campaign-style rally in Phoenix. Police are braced for mass protests in the wake of Charlottesville, and the Phoenix Mayor, Democrat Greg Stanton, made a startling request that the president stay away from his city because his appearance, and expected pardon of Sheriff Joe Arpaio, would "enflame emotions and further divide our nation." 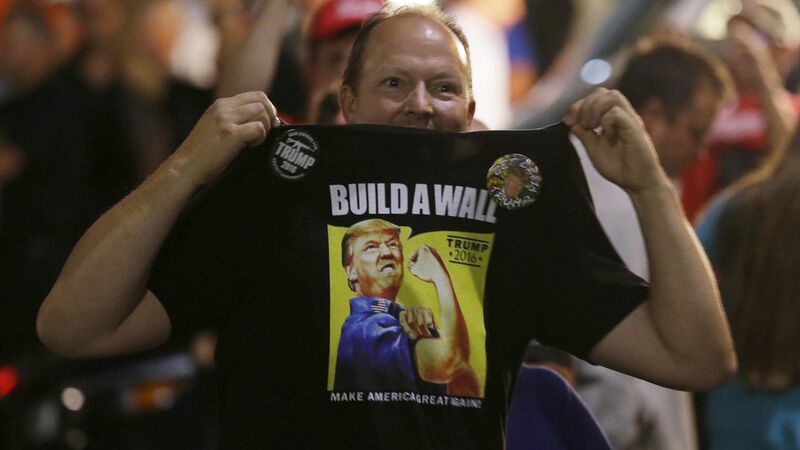 Why this matters: Trump has an opportunity on Tuesday to show his base that he's still as committed as ever, after the firing of Steve Bannon, to the big, symbolic, promise of his presidency — to build a mammoth wall along the border with Mexico. But, but... I can't get a straight answer from administration sources on whether Trump will make a full-throated demand that Congress fund the wall in the government funding bill due at the end of September. Between the lines: Some Trump administration officials are nervous about making concrete funding demands, in Arizona, that will be almost impossible to get Congress to agree to. Some senior White House officials have told conservative allies the wall fight should be postponed until later in the year, after a three-month, kick the can down the road, government funding bill gets signed in September. Either way, the wall fight could ultimately shut down the government. Trump is also likely to promote the administration's success in driving down illegal entries, according to an administration source. Officials view Arizona as a case study of why border fencing works. Trump will likely be joined by Acting Secretary of Homeland Security Elaine Duke, for the official portion of the trip. But which Republican officials will show up to support the president? Will Trump use his speech to attack his enemies in the Republican Senate, Arizona senators Jeff Flake and John McCain? Will Trump pardon Arpaio, as he teased to Fox News? I'm told the relevant paperwork is prepared for Trump to pardon the former sheriff, who was found guilty for defying a judge's order to stop racially profiling Latinos during patrols. But officials won't tell me — and perhaps they haven't decided — whether Trump will announce the pardon on his Arizona swing. Will Trump endorse Kelli Ward as a primary opponent to Sen. Flake? Trump signaled last week that he may be preparing to endorse Ward, but I'm told some of Trump's allies have counseled him to hold off on the endorsement because they think she's a weak candidate.